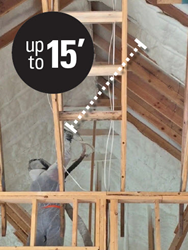 Effective immediately, Quik-Shield 108, SWD Urethane’s revolutionary new spray foam, is now available for sale nationwide through Service Partners, LLC, the largest distributor of residential insulation products and related accessories in the United States. This will enable insulation contractors all over the US to have easier access to the lowest-density, highest-yield open-cell foam on the market. Quik-Shield 108 is a breakthrough, open-cell foam from SWD Urethane. It boasts an ultra-low density of 0.4 pcf, and 360˚ full-fill expansion with heavy-duty adhesion. In addition, the foam features unprecedented long-range application that enables sprayers to work 20% more efficiently and reduces the use of ladders or scaffolding, creating a safer jobsite. Service Partners, LLC, is the nation’s leading specialty building products distribution company and provides significant value to their customers through exceptional service and reliability. Service Partners cultivates strategic partnerships with the nation's leading manufacturers of building products, and they operate an integrated national distribution network with diversified product offerings, strategically located facilities, and the industry's most efficient order processing fulfillment and delivery system. To learn more about Quik-Shield 108 or schedule a demo, contact Service partners at Generalinfo(at)service-partners(dot)com or 877-700-9525. SWD Urethane is a leading supplier of spray polyurethane foam, manufacturing over 100 types of polyurethane foams and polyurea coatings. From 2014 – 2016, SWD has helped its contractors win 26 out of 60 SPFA Industry Excellence Awards. SWD has been in business since 1972, and is one of the fastest-growing spray foam suppliers in the industry. SWD president, Jim Perkins, is also the chairman of the Spray Foam Coalition, a key trade organization for spray foam suppliers. For more information, contact Alan Annis, Marketing Director, at 800-828-1394 or marketing(at)swdurethane(dot)com.